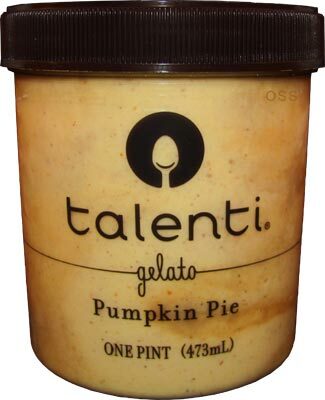 [By Nick, New for 2014, Seasonal] So about a week ago I was joking around with Talenti on twitter saying that they should make a Pumpkin Pie Gelato for next fall. Little did I know that such a flavor was already in development, let alone that I'd find it at my Shop Rite just a few days later. When I saw the pint behind the freezer door, you could say I was more excited than the trendies on the first day of pumpkin spice latte season (or PSL as they call it). Well, you know, minus the yoga pants and ugg boots... maybe, but that's not here nor there. Talenti has graced us with a new pumpkin option for the fall season and I'm happy to be the first to report to the masses about it. Now Dubba and I were talking about the potential of this flavor when we first got word of it and to be honest I was a bit worried. You see, Talenti is known for making some very awesome stuff but sometimes things can be a little too natural for us. With the onslaught of pumpkin products each year from ice cream to cookies to drinks to pretty much anything else, so many companies cheat by using only spices and then leaving the actual pumpkin component to a minimum or not including it at all. 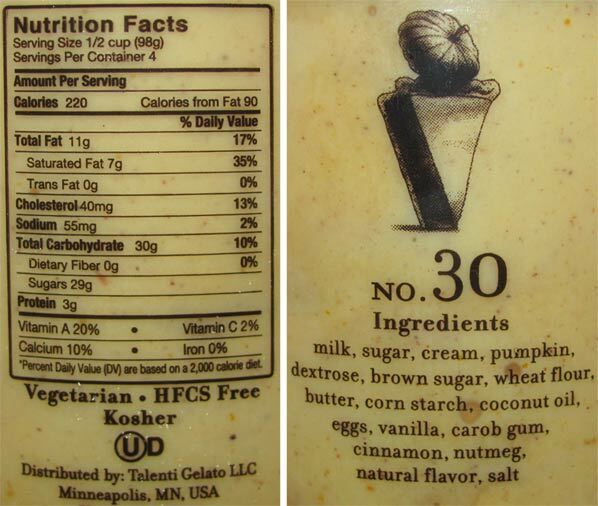 I had a feel Talenti wouldn't go that route and I was correct when I looked over the ingredients. Pumpkin is listed fourth among everything else which is actually even higher than I was expecting. Also while I can see some sort of swirl, I don't see any graham flour or something to suggest of any sort of crust mix-in in the ingredients outside of the wheat flour. Not having an official description doesn't help things either. Enough with the dissection, let's open up flavor #30! Removing the lid reveals more of that swirl I could see on the outside. It almost looks as if it's caramel. You're able to see spices everywhere but surprisingly there's no aroma coming off this gelato. Letting this pint temper was harder than usual but worth it like always. That velvety, smooth texture is such a thing of beauty. As for the flavor, Talenti has done it again because this stuff is remarkable. First off, like I suspected, the pumpkin flavor is strong. That's a good thing though because it's natural and let's for all of the spices to compliment instead of overpower everything. 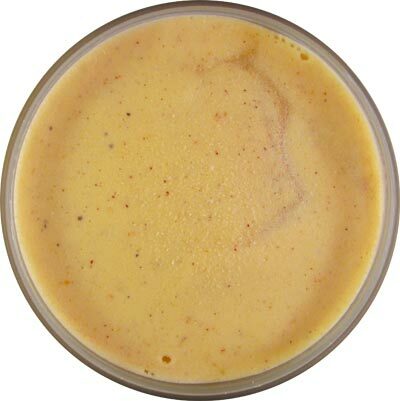 While the cinnamon is the most noticeable spice, there is a decent amount of nutmeg flavor to go around. As for the swirl, well it's not caramel nor is it all that prevalent. I really can't identify what exactly it is but it seemed to be almost like a pumpkin pie spice syrup of sorts. It's quite tasty and amplified the spice flavor profile. I wish there was a bit more swirl in my pint though. I wasn't sure if there was any type of crust component to this gelato and to be honest, I'm still not sure. You can see those almost gingerbread colored chunks, right? Well I can't really describe what they are and if they're a crust, a cookie or some sort of crumble. While they do remind me of gingerbread in taste, there's no ginger listed in the ingredients. Their texture is a whole other story. Some of them are soft and crumbly like a soft baked cookie while others are more hard and crunchy almost like a dense graham cracker. Whatever they are, they're what really brings this flavor together. With all the components brought together, I felt as if I was in trendie heaven. It was really that good. As some of my exs might say, "I can't even right now." Seriously though, this might just be my new favorite pumpkin product and up there for my product of the year. Once this pint starts showing up around you, grab it and a few others because who knows how long it'll be on shelves. Verdict? Finally a pumpkin product that tastes like pumpkin! Buy Again? I will be hoarding these with what little extra freezer space I have. Dubba's Note: Wow, this one is good, really good. It's probably the most vibrant and natural pumpkin flavor I've ever had. In fact, as I sit here recovering from the urge to inhale the entire pint, I think I'll actually throw out a disclaimer. This isn't some sweet pumpkin pie. This isnt some half hearted mainstream ice cream. This is top notch gelato and the spices play a major role here. This one is crazy addictive, especially if you start scooping the half melted edges. Awesome job Talenti. Thanks for the great review Nick, I'll be sure to pick this up when I see it! Oh my God, it actually has Pumpkin in it! That's refreshing..
"With the onslaught of pumpkin products each year, so many companies stick to the spices only and leave the actual pumpkin component to a minimum or not included it at all." I understanding that sentiment with things like M&Ms, but completly disagree when it comes to ice cream. Edy's and Hershey make excellent pumpkin ice creams flavored with real pumpkin puree, as does my local Weis store-brand. And Turkey Hill's Pumpkin Pie is oustanding. I don't doubt Talenti is good, but for the price tag and size I doubt it's that much better than the other options to always get the nod. Adam x2: pretty sure Nick meant "pumpkin" products in general, not with frozen treats in particular. pumpkin ice creams always have pumpkin. at $5.99 a pint, i can see where people would be scared off by talenti, but several stores carry it for $3.99 and I have no problem treating myself to their all natural excellence at that price. If you havent had talenti, you are doing yourself a disservice. Danielle, no problem! Be sure to report back with your thoughts. Adam Huzzey, it's a glorious thing especially when it's a main component. Adam, yeah I was talking about pumpkin products in general when it comes to including actual pumpkin in high quantity versus having the spices being the main component. As for the other frozen desserts, I haven't had Hershey's or Weis' but I have had Edy's and Turkey Hill's. Edy's basically suffers from not having enough pumpkin flavor and really just reminds me of a cinnamon ice cream. Turkey Hill's is pretty awesome stuff but this is far better even when price is factored in. Heck, I see Talenti on sale for around $3 a pint so it's not like it's some outrageous price either. I'll take quality over quantity any day of the week. 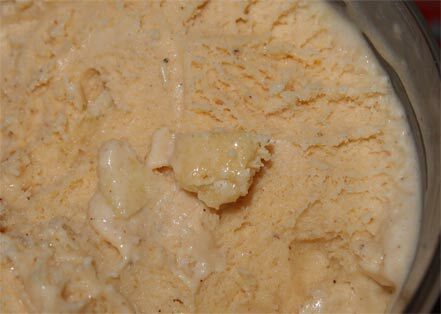 Perry's Pumpkin Pie is my second favorite ice cream of all time, love it....and it has pumpkin. Totally disagree on Edy's. It's actually the best pumpkin product I look forward too most each year. Sarah, I'll be trying Perry's soon since stores finally carry it around me. When I was referring to the lack of actual pumpkin I was talking about all pumpkin labeled products not just frozen desserts. Adam, to each their own. @Sarah: definite thumbs up to Perry's! @Adam: slow churned or grand? The last time I had Talenti Gelato was the Pistachio flavor, I completely agree with Nick that if it taste good than it is worth the high price but I thought it was the worst pistachio Gilato I've tasted and it completely put me off Talenti (first time I bought Talenti for full price and to me it was just eh) but after this review you may have swayed me to try Talenti Gelato again. I don't see a swirl or any cookie bits in your pictures. 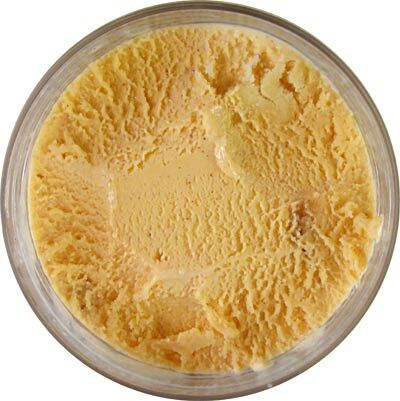 Are you sure there isn't just a straight pumpkin pie flavor ice cream base with no mix-ins? Anon, I think you've got a bad batch of that pistachio because I had the complete opposite feelings towards it. I'll have a review for it in the near future up. Stride, you can't see the swirl in the opening shot or the discolored pieces throughout the gelato? I know they might be hard to see but I did in fact eat this so I know what I was tasting and feeling in my mouth. This isn't a plain base by any chance. I'll take your word for it, but I am surprised you did not challenge me to buy a pint and find out for myself. Talenti needs to start labeling their containers with the description of the ice cream. Stride, not sure why I'd challenge you to try it when I know what I experienced and know what others will get as well. As for labeling, I agree but they're not the only company that does that. Even Edy's didn't label their containers which are 3 times the size until recently and that's only for a few flavors. So glad I finally got to try this flavor! Defiantly a mature pumpkin flavor, and in my container there were plentiful pie pieces, although I wish it had more of a pumpkin taste. Overall it was awesome and a different take on the pumpkin craze! I cant find this anywhere! I am in Maryland and have hunted at all my local stores and cant find it. Any suggestions?!?! This is a great review. Dead on. As you noted, all of their gelatos are top notch but this one is extraordinary because of the range and quality of the ingredients. They also managed to get all of the amounts just right..not too sweet, just the right amount of nutmeg, etc. And I just paid 2.88 for this on sale at Shoprite but have seen it for as high as 6.19. Danielle, but can you think of another pumpkin frozen dessert with as much pumpkin flavor? Victor Araju, I really would have no clue where you could find it. Just be patient since Talenti hasn't even officially announced this flavor exists yet. Other Victor, I can't help be think we're both in the same area with your mention of Stewart's on our Companies page as well as the sale Shop Rite is having near me as well. Hello, possible possible Upstate New Yorker! Seriously though, the pint is up for grabs. YUCK. Does anyone know where I can get this in NYC ??? I've searched everywhere and no one is carrying it.. I'm desperate! I found this gelato once this year and can't find it again!! The "cookie" chunks you describe is actual pie crust, which can be made with just flour, water and either butter or shortening. I think the pie crust was one of my favorite things! Finally found this at Whole Foods! I loved this flavor! The pumpkin flavor was very strong and my pint had plenty of pie crust, which was probably my favorite part. I also found that it also had a hint of citrus flavor, but I'm not sure why.